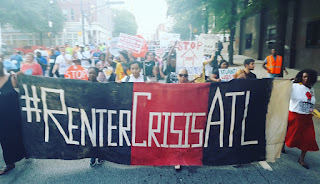 Yesterday members of the Housing Justice League took the streets of downtown Atlanta and Marched to the Fulton County Courthouse and the County Commissioners office. The march will be led by Atlanta residents who have experienced or in the process of experiencing the eviction in Fulton County. Atlanta has been declared to be in a renter’s state of emergency. 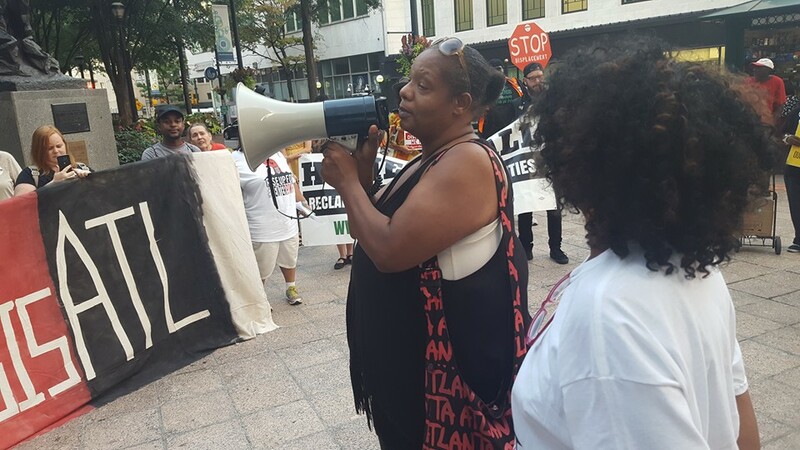 Right now in Fulton County the number of evictions has dramatically spiked to 500 a week! Many of those evictions are as a result of arbitrary rent increases that often come with no changes in tenant amenities. The eviction process in Fulton County is not only cruel, its decades behind the rest of the country. During eviction court in Fulton, which happens twice a week, Judges sign off on an average of one eviction per minute. A whole sickening economy has developed around the eviction process in our county with over ten 3rd party eviction corporations thriving off the crisis. We call on the Fulton County Commission to take immediate action to change the eviction process in Fulton County. The following recommendations are working in other parts of the country, they are not revolutionary proposals but they would make the eviction process more humane and less difficult to bounce back for tenants in hardship. These changes are but a step in the right direction. 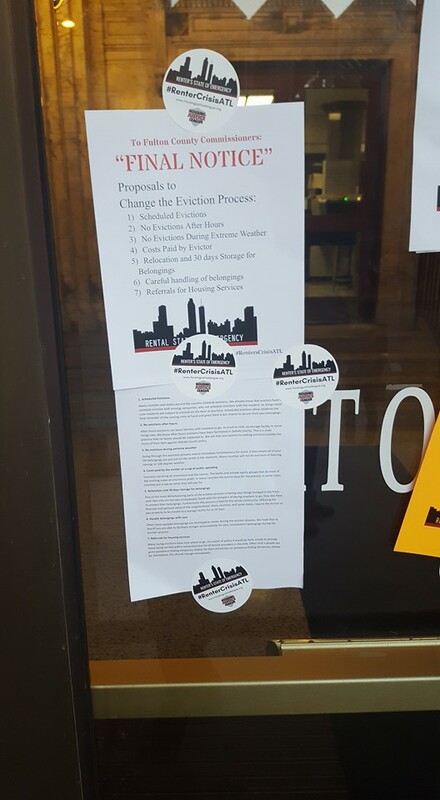 Many facing evictions have now where to go. As a point of policy it would be fairly simple to provide those being evicted with a comprehensive list of service providers in the area. Often time’s people are given assistance finding temporary shelter for their animal but no assistance finding temporary shelter for themselves, this should change immediately. 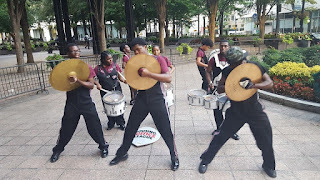 On Wednesday, September 7th at noon on Georgia State University’s Library Plaza, the Housing Justice League joined forces with the Turner FieldCommunity Benefits Coalition(TFCBC) and Georgia State University students to demand conversation about the University’s purchase of Turner Field stadium. Current action has engaged thousands of Turner Field residents in developing a draft Community Benefits Agreement (CBA) that ensures new development benefits long-time residents. The Wednesday noon action advanced local talks to GSU’s doorstep, and initiated conversation with Pres. Becker and power brokers on campus. 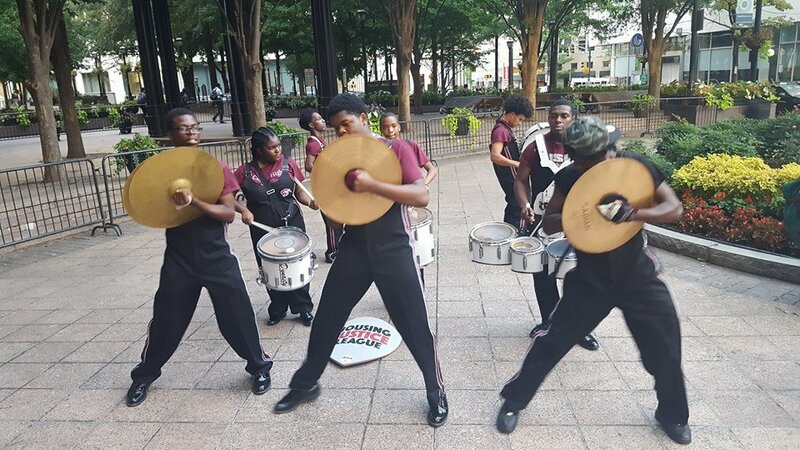 The Library Plaza March included a large, intergenerational crowd of GSU students and local Turner Field residents. Solidarity and community was strong between the two groups. As part of the opening statements, Turner Field resident Jane Ridley noted that conversation with GSU was necessary to ensure the NPU-V community did not face further gentrification. 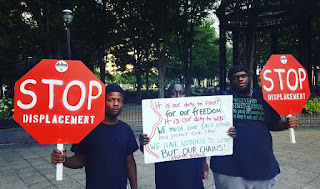 “We’ve faced problems with the Braves Stadium, and it looks like we might have more with this one… we need conversation to protect ourselves. The neighborhood can’t face further evictions.” Her words echoed the Liveable Centers Initiative, that any future development in Turner Field remain transparent and inclusive to the community. Students and residents marched together to President Becker’s office, chanting songs like “Ain’t Gonna Let Nobody Turn Us Around.” The crowd swelled along the way as more students and school staffers joining the rally. Marchers congregated in front of Centennial Hall to determine appropriate steps forward. Movement eventually continued peacefully into the building, and to the Administrative Office on the fifth floor. 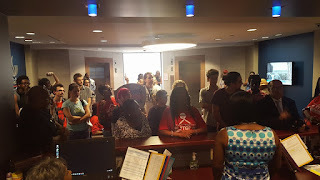 At President Becker’s Office, State Senator Vincent Fort, joined demands that the GSU president make time for community members and students, and meet residents face-to-face. “He’s not too busy for us,” Fort retorted, “and if he is, then he isn’t doing his job.” Organizer and resident Sherise Brown headed conversation with President Becker’s secretary, passing along the letter demanding conversation with the president. The crowd of students and residents stood firm to rejection and backed Sherise’s negotiation. Though no meeting was confirmed, Sherise exchanged information with Becker’s secretary and pressured for more communication. The delivered gave president Becker 7 days to respond to the request. 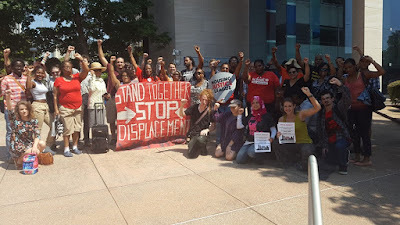 The CBA Proposal the resident led TFCBC wishes to discuss with President Becker keeps the community’s needs front and center, and offers a sure path to accountability and development without displacement. The Coalition consulted a wide range of experts, community members, and both local and national institutions to develop a comprehensive Community Benefits Agreement Proposal. The CBA provides opportunities for GSU to both fulfill its general Strategic Plan and incorporate recommendations from the LCI Study which was completed last month. The Housing Justice League stands ready to work with TFCBC and GSU to turn the CBA Proposal into a full-fledged agreement that ensures success and does not leave impacted communities behind. 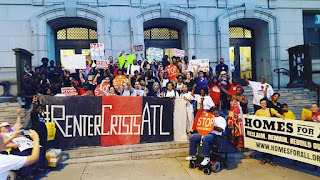 We encourage folks to sign andshare the online petition encouraging president Becker to meet with community members who will be impacted by the purchase of Turner Field and to insure they have a seat at the table as plans are being made that are sure to have a deep impact on their community and their lives.